One perfect lavender potted phalaenopsis orchid plant is accented with a curling branch, and presented with a ribbon bow tied right around the middle. 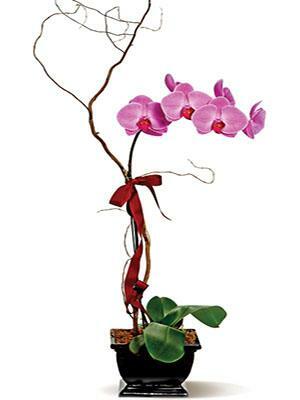 This purple orchid plant is a low-maintenance, long-lasting and exotic gift will create quite an impression! Looking for Rancho Penasquitos flower delivery? Contact Four Seasons Flowers today!